First, I connected the PiTFT display board to my PI2 using 2 extension ribbon-cables (14 wires each) which connect pins 1-28 of the PI2 to the corresponding ones on the PiTFT. This keeps the display flexible in my cluster-stack of ARM boards which contained the PI2. I then followed the published Easy Install steps to make sure the display works, i.e. 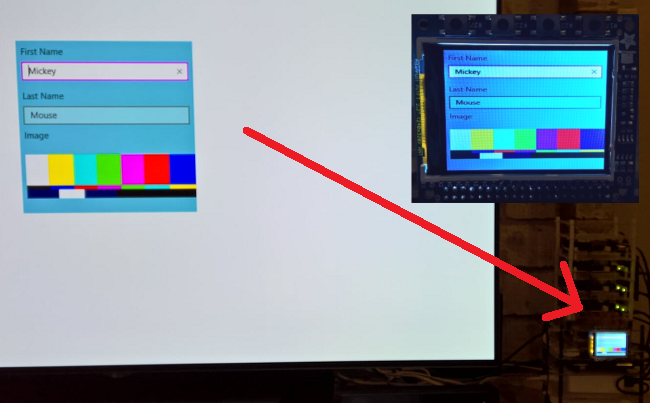 boot up Adafruit’s custom Raspbian Linux distribution. After this initial setup, the Windows 10 installation on the PI2 can be accessed using a browser. 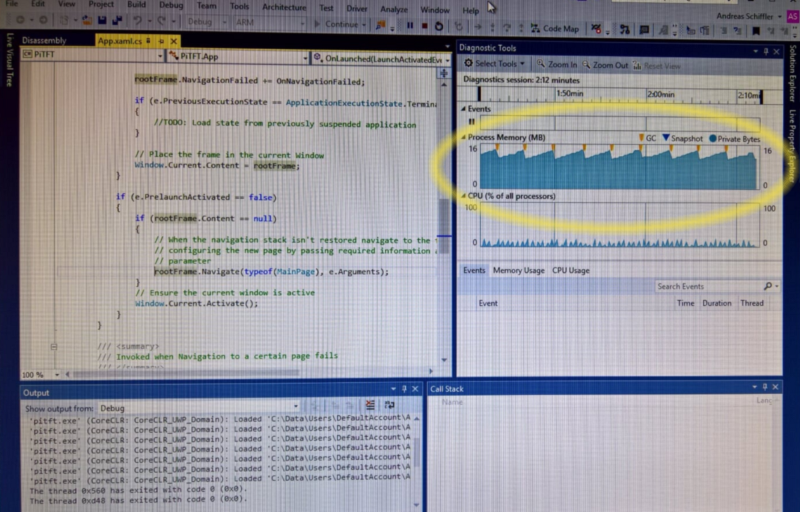 Windows IoT comes with a ton of samples code on github which can be opened in VS2015 and deployed to the PI2 for testing the overall workflow and verifying the new Windows IoT setup. On to the real problem: getting the PiTFT 2.2 board to display some pixels. Limitations? yes, it is not real-time fast and you won’t be playing games with this; but it is good enough for informational displays, clocks, charts, or image slideshows. Unfortunately, the constant re-rendering of the XAML grid into memory will put some pressure on the GC which has to clean up the constantly created temporary bitmaps and pixel buffers. The MIT licensed code for this project – a C# driver for the Adafruit PiTFT 2.2 – can be downloaded here.